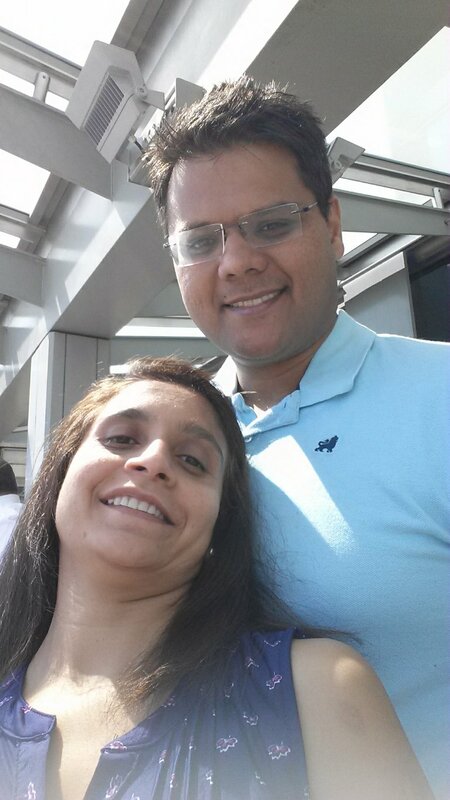 The past weekend we drove to Newark/NJ to accomplish a lot of things – Attend a reception party, show in-laws NYC, Global Entry interview at Newark Airport and last but not the least is enjoy curry omelette at Embassy Suites Newark Airport. The past weekend we were scheduled to attend a reception party in New Jersey of our close friends. I am in the process of re-qualifying GOLD with Hilton (That gets you complimentary upgrades, FREE Breakfast, more bonus points and a lot more goodies). The gold status is awesome as a typical buffet breakfast in these hotels can easily cost $20 or more per person and the cost is even higher while staying at Hiltons in Europe. I recently applied for the Citi Hilton Visa Signature card that for a limited time has an increased sign-up bonus for 75000 HHonors points. I wrote a post on it few days ago. The holders of the credit card automatically get Silver Status with Hilton which is not too shabby for a no-annual fee credit card. And, with just four stays you can qualify to be GOLD with HIlton. I used 24,000 HHonors points and $150 cash to book two nights at the Embassy Suites Newark Airport. The cash only stay was $259 per night so definitely a good use of Hilton points and cash option for decent savings. Obviously I charged the $150 on my favorite Barclay Arrival World Elite Mastercard so the cash portion will cost me even less after redeeming for travel credit. I always enjoy staying at Embassy Suites especially for the Complimentary Evening reception (free booze and snacks) and the awesome breakfast buffet with the Omelette station. The chef surprised me with a special Curry Omelette loaded with veggies something not on the regular menu. The omelette was DA BOMB!!! If you happen to be stay at Embassy Suites Newark Airport do ask the chef to prepare the curry omelette for you from his stack of secret recipes. Another reason I chose to stay at this hotel is because they have free airport shuttle and it made getting to Newark Airport for our Global Entry appointment that much easier (FREE). I have two credit cards in my stash – Citi Executive Credit card and the Citi Prestige credit card that both waive off $100 fees for Global Entry (includes TSA-precheck). I charged both of our fees (wife and I) on the two cards. The interview was straight forward and took us max 10 minutes. I am ought to love global entry – No more taking off clothes at airport, Laptop remains in bag, quick access lines and you do not have to face a custom agent after arriving back in the US while traveling internationally. More benefits of Global Entry can be found here. 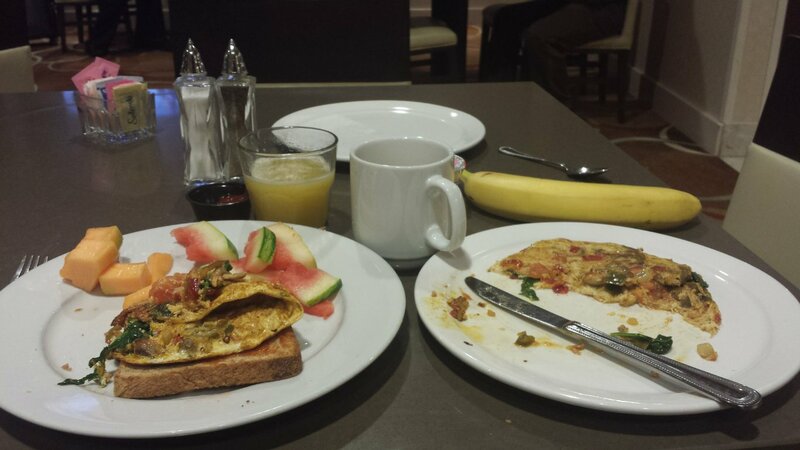 Overall it was a fun and hectic weekend but the infamous Curry Omelette definitely took my breath away and I may stay again at the Embassy Suites Newark Airport just for it!!! Would you like to Travel the world for pennies? 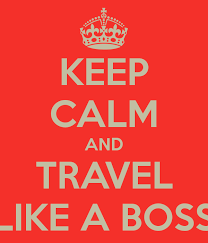 Shoot me an email to help you get you started with my TRAVEL COACHING PROGRAM. I will help you save thousands while turning your travel dreams into reality.